The practice of remembering that you will die helps you to keep in mind that your life will end, and that it has a goal: heaven. 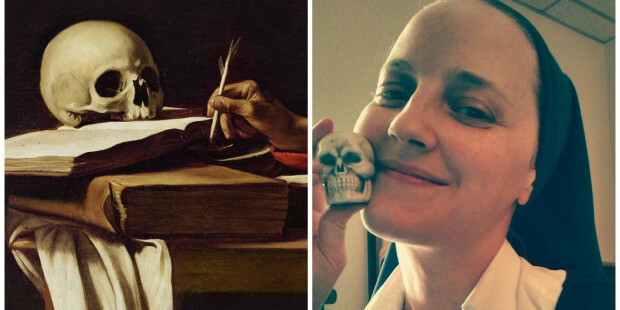 Visual reminders — often called memento mori, the Latin phrase for “Remember that you will die” — are one way we can keep our impending death in mind. Saints Jerome, Aloysius, and Mary Magdalene, among others, are often depicted in classic paintings with skulls. Saint Francis of Assisi once signed a blessing to Brother Leo with the tau cross and a small drawing of a skull. Pope Alexander VII commissioned Italian artist Bernini to make a coffin that he kept in his bedroom along with a marble skull for his desk to remind him of the brevity of life. Blessed James Alberione, the founder of the Daughters of Saint Paul, also kept a skull on his desk. Inspired by this Christian tradition of memento mori, I recently acquired a ceramic skull for my desk. I have been chronicling my spiritual journey for over a month on Twitter. And it has changed my life. To read Sister Theresa’s entire article, click HERE.